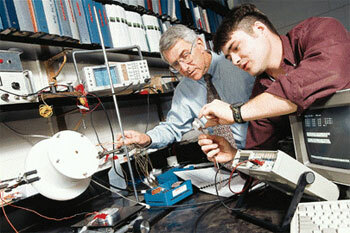 Began at Tech in Fall 1967 as an Assistant Professor. Dr. Black's research has concentrated in three areas: thermal management of microelectronic packages, heat transfer from electrical systems, and modeling of fire development and smoke movement in building fires. The thermal management work has developed into the design of a cooling module that can be incorporated into a microelectronic device such as a cell phone, laptop computer, or radio. The module is capable of removing a large amount of heat from a small surface, such as a microprocessor chip used in all modern computing systems. The module uses a vibrating cell to generate numerous, micron-sized droplets of liquid that can be directed toward the heated surface where they evaporate and remove the generated heat. By effectively cooling the chip, the module improves the reliability of the component, and it maintains the surface temperature at acceptable levels. Other variations of the spray cooling module include a design that incorporates small microjets of air that improve the cooling efficiency. The large-scale electrical cooling research centers on the development of computer programs that calculate the ampacity or current-carrying capacity of systems such as overhead conductors, underground cables or transformers. Several ampacity codes have been completed that permit the calculation of cable temperatures so that cable systems can operate at economical levels and do not create unsafe temperature levels. In the event of a building fire, the majority of injuries are a result of smoke inhalation. Therefore, to improve safety margins, engineers must know how a fire develops and how the smoke moves during a fire event. Dr. Black's research has resulted in several fire codes that estimate how the smoke moves through a building and how to improve the building design so that the spread of the smoke is either controlled or minimized. The codes apply the conservation of mass, energy, and momentum to the air within a building. The result is a detailed analysis of the movement of smoke, and these codes can be used to improve fire-related building designs. Dr. Black's research has been sponsored by The Southern Company, Motorola, AT&T, Texas Instruments, Sun Microsystems, Panda Corporation, and the National Science Foundation.